I know I just regaled you with the merits of tourist traps, but going off the beaten path is worth delving more deeply into. I was first intrigued by the thought of traveling to Iceland because it wasn’t heavily trafficked. Mind you this was 5-6 years ago, and since then it has become quite the popular destination, with upwards of a million tourists a year – quite a lot for a country of 320,000 people. Even so, the attraction never faded for me. So when I visited in 2014, I stuck to my philosophy of pursuing unique experiences by avoiding typical tourist attractions, and it was unbelievably rewarding. When driving up to the Westfjords, one of the least visited areas in Iceland, I pulled over and saw the Northern Lights above me, while a pod of 20+ whales frolicked in the water beside me. I found the experience to be extremely affirming since it happened by chance. This sort of thing happened repeatedly in the Westfjords, which is why I’m back here for another 3 weeks. Before coming to the Westfjords this time around, I spent more time in the Southwest region of the country, where most tourists spend their time. After visiting some of the hot spots (literally!) we pursued lesser-known areas, such as the ghost museum in Stokkseyri. While this museum isn’t exactly unheard of, it’s a decent drive from Reykjavík and the most popular tours will take you to the famous natural attractions, like Geysir and Gullfoss, rather than spooky ghost museums. But they should take tourists here. I can’t speak more highly of this museum, as a person who seeks authentic experiences and also has a penchant for the supernatural world. Designed somewhat like an American haunted house, this museum puts you on a guided tour of Iceland’s most famous ghost stories, and the way it’s set up makes you feel like you were actually there when they happened. It’s a great way to learn about traditional Icelandic folklore, and to feel genuine terror! All for only $15. After being sufficiently spooked out, we headed to a town called Hella, which I wanted to visit since “hella” is a popular colloquialism originating in my home region. What I didn’t know is that Hella is dotted with caves built as late as the 14th century, and formerly used by monks. If I spoke Icelandic, I would know that the root word “hellar” means caves. Our Icelandic friend Hákon had vacationed here when he was younger and used to explore the caves with his siblings. Now it was our turn to explore. I’ve illustrated one of the entrances to the underground network above, and you can see what one of the cave tunnels looks like in the photo below. 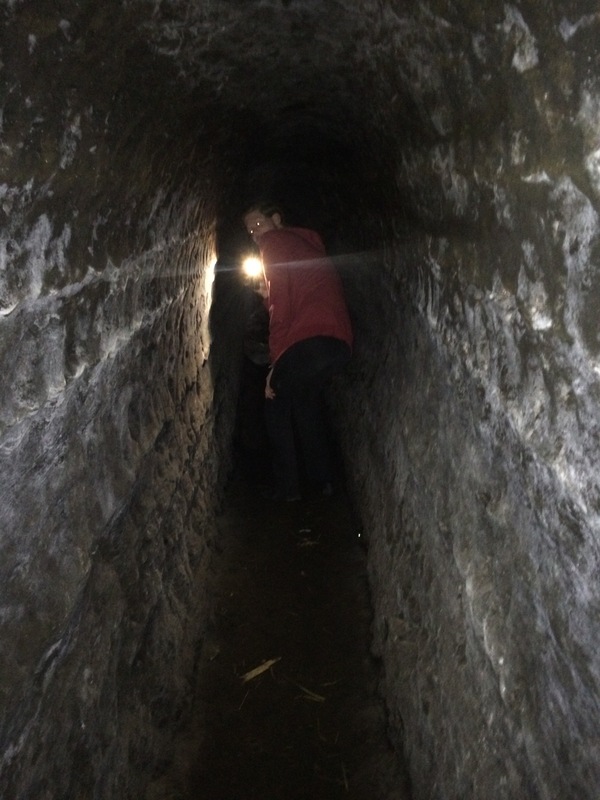 It was genuinely scary exploring those caves, especially after spending the previous hour learning about all the ghosts and spirits that haunt the exact area we were in. I’m fairly sure we were trespassing, but a quick Google search tells me that a cave tour exists, though that same search reveals it is pretty much unknown. I categorize this experience under Locals Only, and I’m extremely grateful to have had it. These caves make Iceland what it is, and could have only happened under the right mixture of circumstances. It’s something I will never forget, and reminds me why it’s important to go off the beaten path – away from the tourist traps and why sometimes risks should be taken. 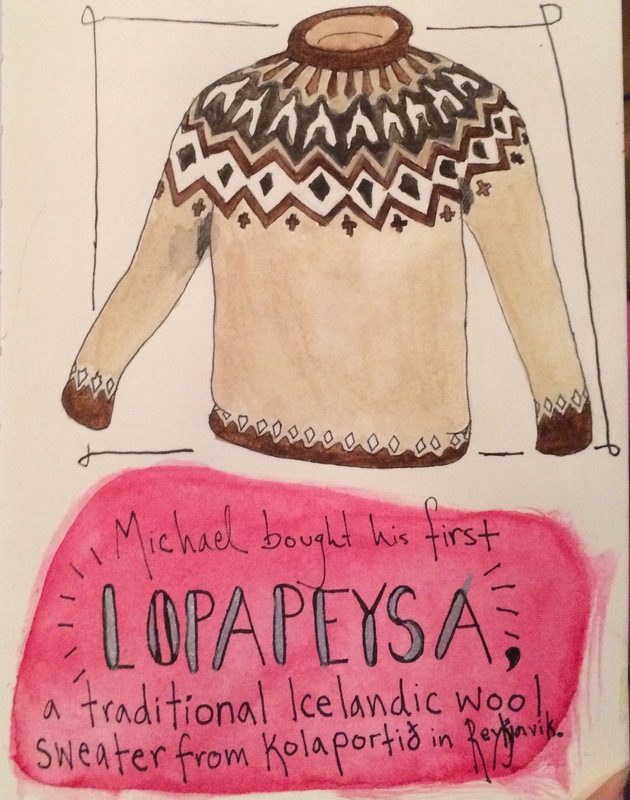 In other news, Michael is the proud new owner of a Lopapeysa, the quintessential piece of Icelandic clothing. Made from Icelandic sheep’s wool, it is insulating, hardy, and beautifully designed. I illustrated his purchase below.